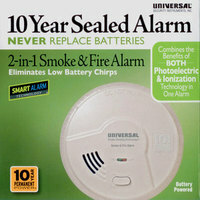 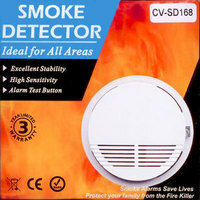 The Universal Security Instruments SS-770-24CC Battery-Operated Ionization Smoke and Fire Alarm responds quickly to fast-flaming fires to protect your family against deadly threats in the home. 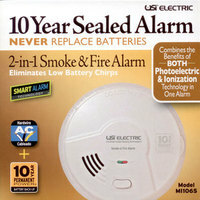 This alarm is operated by 9-volt batteries (included) and is suitable for installation in houses, apartments, dormitory rooms and mobile homes. 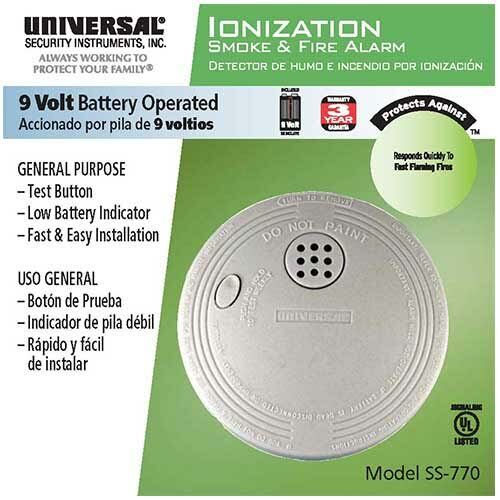 Fast and easy to install with no wiring required, the SS-770-24CC features an audible low battery indicator, a cover to protect against contaminants and an alarm/power test button to ensure that the device is functioning properly.